Slice squash in half longwise. Bake squash, skin side up, at 350°F for 50-60 minutes, until very soft. Let cool and pre-heat oven to 375°F. Add olive oil to a large skillet over medium-high heat. Add tomatoes and a pinch of salt. Let tomatoes cook until they get soft. Use a spoon to press on them and burst them open. Continue to cook tomatoes down for 10 minutes. Add crushed red pepper if you're using it. 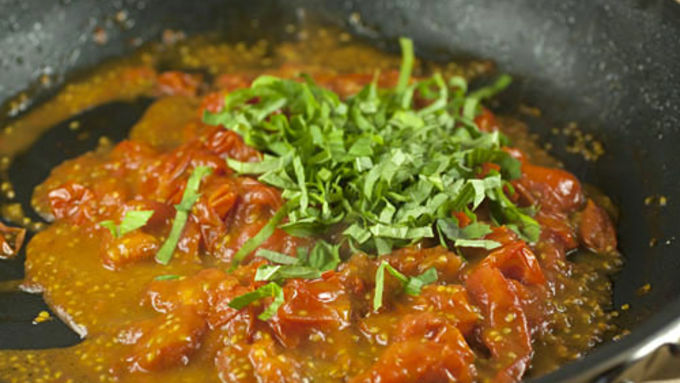 Once tomatoes are thick, turn off heat and add fresh basil. Stir to combine. 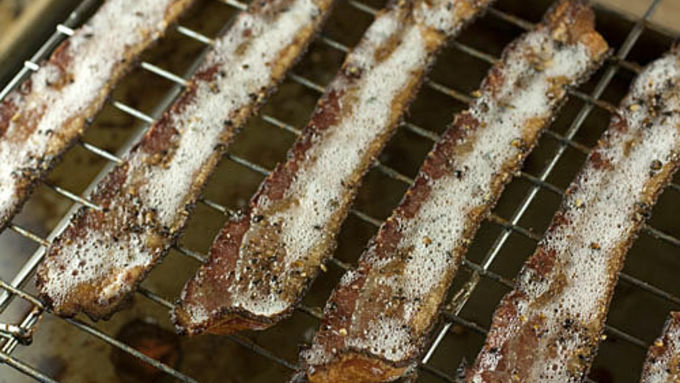 Bake bacon on a baking sheet at 350°F for 15 minutes so it stays nice and crispy. It works best if you can cook the bacon on a wire rack. Once squash is cool enough to handle, scoop out the seeds and use a fork to lightly scrape out the inside flesh of the squash, which should form strands that look like spaghetti. Mix squash flesh with ricotta cheese in a small bowl and add a pinch of salt and pepper. Lightly butter a 2.5 quart baking dish. Then layer in half of the spaghetti squash mixture. Top squash with tomato sauce and bacon strips. Then cover with other half of squash mixture. 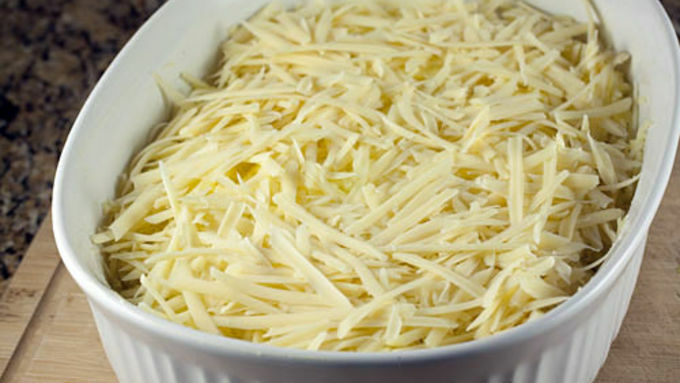 Top with grated Gruyere or swiss cheese. Bake casserole at 375°F for 20-25 minutes. Serve immediately! Let’s face it. Most veggies in the store can be a bit boring. Nobody gets excited about broccoli or celery. Even the more exotic looking veggies (different colored radishes, for example) are still pretty standard. Don’t get me wrong. I eat all of these delicious veggies and love them. But I’m not sure that I would describe them as fun. 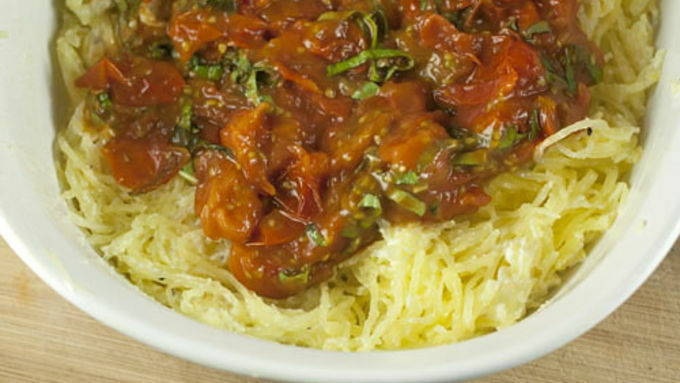 Enter spaghetti squash, hands down the most fun gourd on the market. It’s seriously a magical thing. I dare you to make one and not smile when you start shredding the squash flesh and it somehow turns into spaghetti strands. It’s just cool. 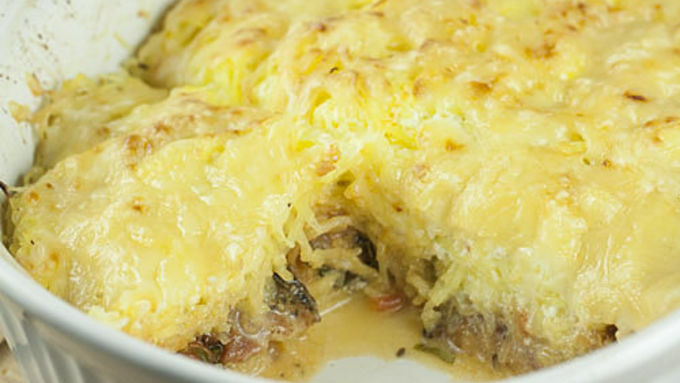 I’ve cooked spaghetti squash a lot of different ways over the years (because it’s fun) but this spaghetti squash casserole is one of my favorite ways to prepare it. Talking about the casserole now though is getting a bit ahead. First you have to master the art of cutting one of these things in half! This is always kind of awkward, but this is seriously the hardest part of the recipe so just work through it. The easiest way I’ve found to cut one in half is to start with my biggest knife (10 inch chef’s knife) right in the center. Push down on the knife so it stabs into the squash. 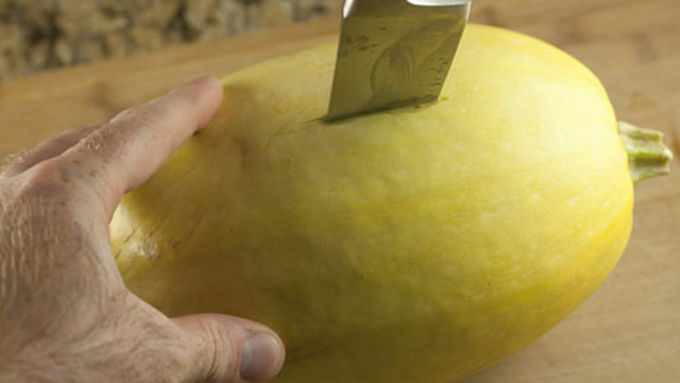 Then, once the knife is all the way into the squash, push it down and it will slice half of the squash open. Repeat on the other side and you should be done. 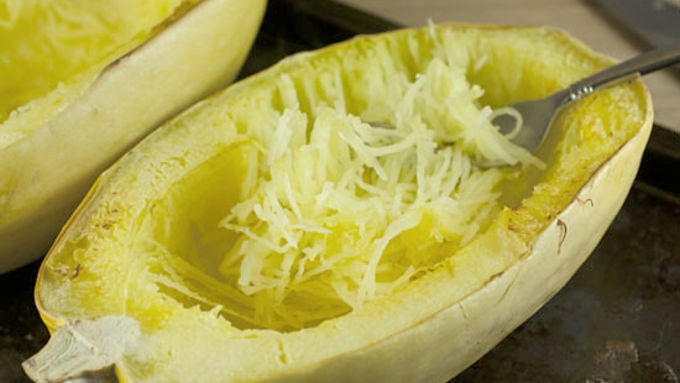 Once your squash is halved, bake it (skin-side up) for about 60 minutes at 350 degrees. After it comes out of the oven, let it cool until you can handle it. Then scrape out the seeds and use a fork to start lightly shredding the flesh. This is the fun part! You could use cottage cheese instead of ricotta without a problem for this recipe. There’s nothing especially hard about this recipe, but the end result is a pretty impressive casserole. 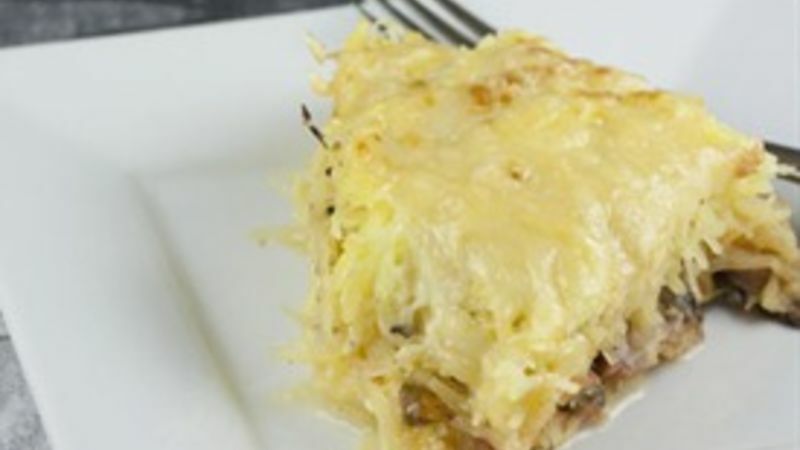 People will think it’s some kind of crazy baked pasta dish until they try it. The squash actually makes it a much lighter dish. It’s fun, reasonably healthy and just plain tasty. 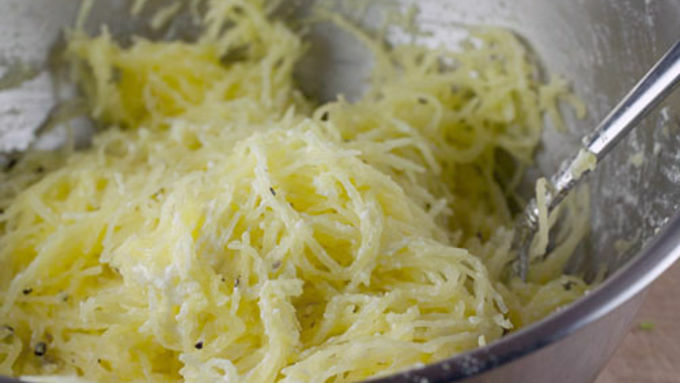 Next time you see a spaghetti squash, grab it!